Distraught S’porean Retiree Loses $250,000 CPF Retirement Funds To Bad UOB Investments; Shares His Plight Publicly On S’pore Street – Sinking It In! An unidentified Singaporean retiree took to the streets of Singapore to complain about the losing of his entire retirement funds after he allegedly invested it with UOB bank. 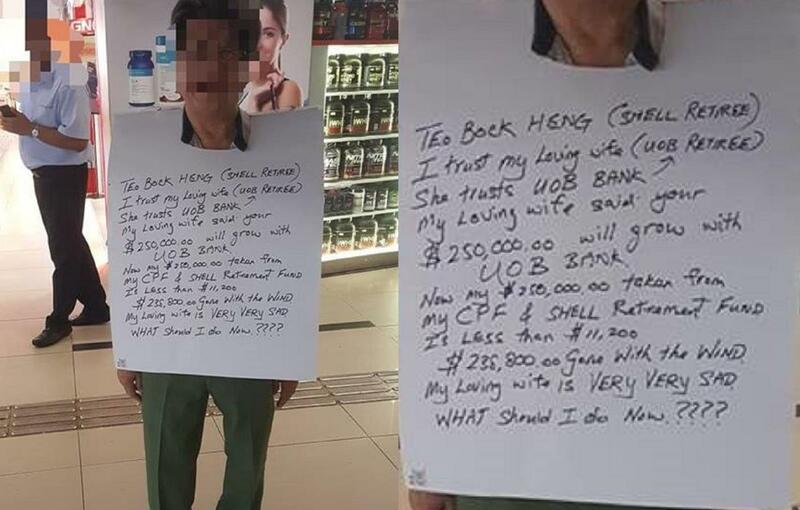 The man wore a placard around his neck and on it described the predicament of how he took out $250,000 of his CPF and Shell Retirement Funds, invested in UOB bank because his wife trusted them, only to be sorely disappointed when the investment turned sour and is now only worth a measly (in comparison) $11,200. It is however unclear why the retiree felt the need to go public with his private misfortunes. It was after all his decision to grow his retirement funds with UOB bank and as with any other investment instruments, the returns are never guaranteed. This should be a wake up call to any would be investors to only commit to any investments after the proper research has been gone, investments of huge amounts of money should not be done simply on TRUSTING the financial institution. She trusts UOB Bank. My Loving wife said your $250,000 will grow with UOB bank. Now my $250,000 taken from my CPF and Shell Retirement Fund is Less than $11,200.